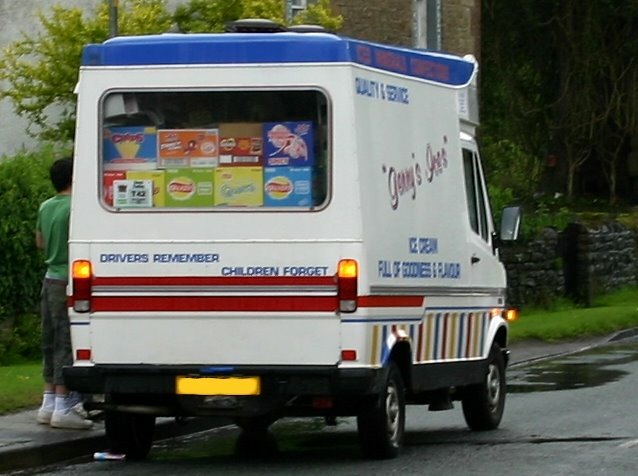 It was with total disbelief that I read a news item the other day about how in Britain there is a move towards banning ice cream trucks from parking in residential streets to sell their ice cream. Crazy or what?! Apparently, some local councils are fearful that ice cream trucks may cause a public nuisance and could even contribute to childhood obesity. So some are no longer issuing street vending licences to ice cream sellers. I grew up looking forward every week to the ice cream truck coming down our street, parking within easy walking distance of our house and being allowed by my parents to go and enjoy a special treat of a vanilla ice cream cone sometimes smothered in raspberry sauce or with a chocolate flake. The memories come flooding back as I begin to reminisce. Some of the happiest days of my childhood were ice cream days like that. Moreover, I didn't become obese as a result! I know I'm not alone in my feelings too - many people eat an ice cream cone and can't help but smile as they do so, recalling fond memories of enjoying ice cream when they were younger. Then there are movies where eating ice cream cones is portrayed as no less than a part of our cultural heritage - take for example 'The Day The Earth Stood Still' (1951 original with Michael Rennie). There's a scene where the man from outer space spends a day out in Washington getting a taste of what human life is about and he gets to eat an ice cream cone. Speaking of Washington, President Obama has a love ice cream that he's happy to share with his family, as witnessed last year during the presidential elections. Read about it in my US Presidents and Ice Cream blog post and also how Senator McCain reacted excitedly upon hearing an ice cream truck whilst he was out campaigning. Very pointedly, none of the people mentioned are obese. So come on Britain, let some common sense prevail please and leave the ice cream man alone!